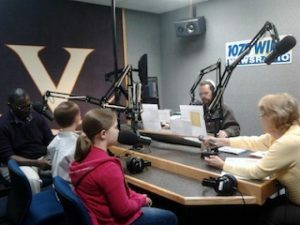 John Hunter was recently interviewed about the World Peace Game on Charlottesville’s morning show on WINA 1070. He describes their classes’s recent visit to the Pentagon. The Pentagon invited John and his student delegation to visit as a result of a screening of “World Peace and Other 4th Grade Achievements” in November 2011. Joining John on this interview are two students who visited the Pentagon. One was a Prime Minister of one of the World Peace Game countries Another student was the lead arms dealer. Their impressions about their visit to the Pentagon and their knowledge of world affairs because of playing the World Peace Game is astounding. It is also amazing to hear the children talk about how their career paths have been affected by this visit. The students tell about the Pentagon’s shopping opportunities and their experience of meeting Secretary of Defense Leon Panetta who asked them about their favorite world crises. Students were able to share some of their world solutions. Here is the link if you would like to listen to the full interview on WINA.